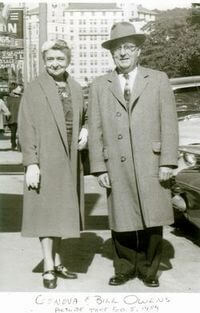 Owens Funeral Home was founded in 1925 by William H. and Geneva Owens. "Old Bill" served in the US Army's Fifth Division in France during World War I. He was active in many civic organizations and was fond of practical jokes. He served as president of the Champaign County Draft Board during World War II. Geneva was also very active in the community as well as the business and held an apprentice funeral director's license. Our founders provided a strong sense of service to both country and community that is carried on today with our involvement in many local organizations including: VFW, American Legion, Knights of Columbus, Rotary International and Junior League of Champaign-Urbana.